The tufted apple bud moth (Platynota idaeuslais; TABM), one of many tortricid fruit pests, is found throughout eastern North America and is the most common leafroller occurring on apples in the Southeast. 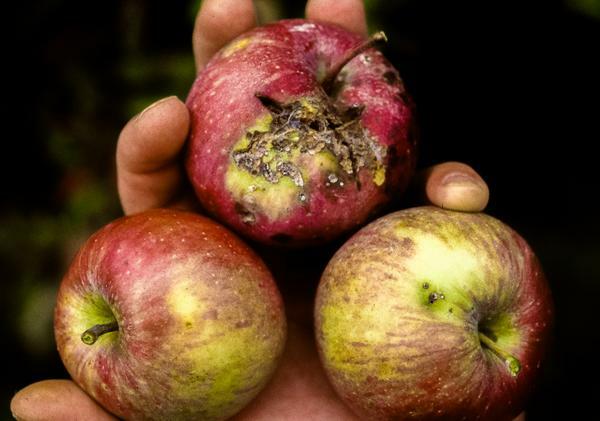 In the 1990s it was the most destructive apple insect pest in the region, but populations were greatly reduced by the introduction of new insecticides in the early 2000s. Today, significant levels of TABM damage are relatively uncommon in North Carolina. Adult TABM are 1/2-inch (12.5mm) long triangular moths with a mottled gray-brown color pattern and pronounced mouthparts that extend beyond the head. Pupae are light brown and about 1/25 inch (10mm) long. 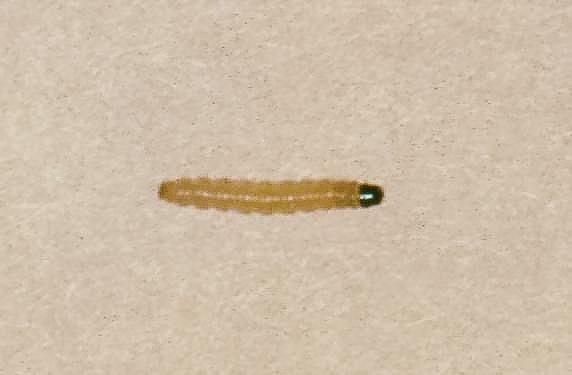 Full-grown larvae are light brown or tan and about 3/4 inch (19mm) long. 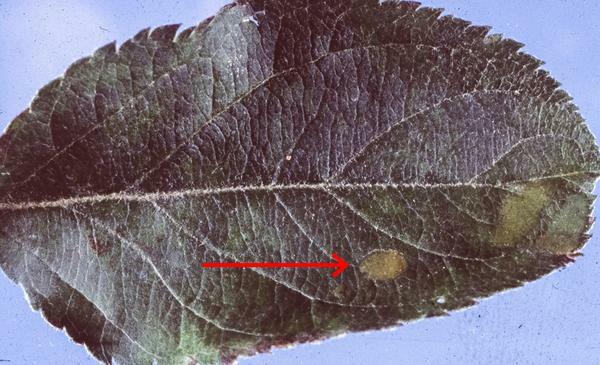 Eggs are laid on leaves in masses containing approximately 150 eggs. 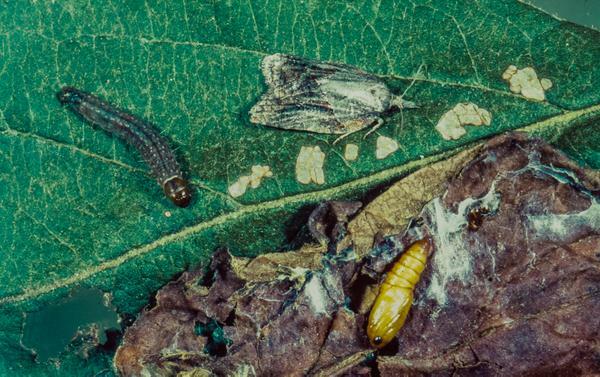 TABM life stages (counterclockwise from left: larva, pupa, adult). TABM overwinter as second- through fourth-instar larvae in debris on the orchard floor. In early spring they complete their development on root suckers or broadleaf weeds, pupating and emerging as adults in late April. Eggs are laid from late May to June. First generation larvae primarily feed on foliage, though some larger specimens may begin attacking fruit by July. After pupating, these adults lay eggs which develop into second generation larvae, which feed on fruit from August to September. In autumn, remaining late-season larvae will drop to the ground to overwinter. There are two generations per year in North Carolina. Larvae sometimes feed on the undersides of leaves, folding and webbing the leaf together to form a shelter. 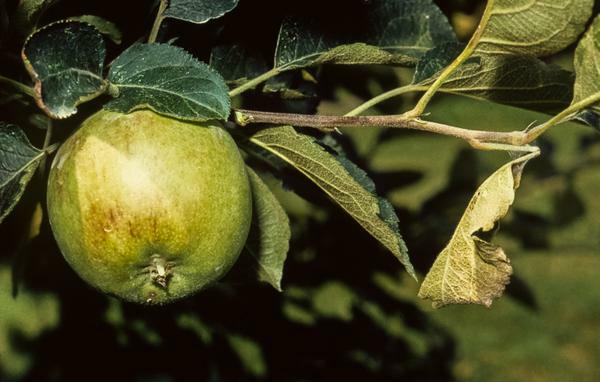 Likewise, leaf shelters are often attached to apples where larvae are feeding on the fruit surface. Larvae may also attack the cavities at the calyx and stem ends as well as the places where two fruit touch. 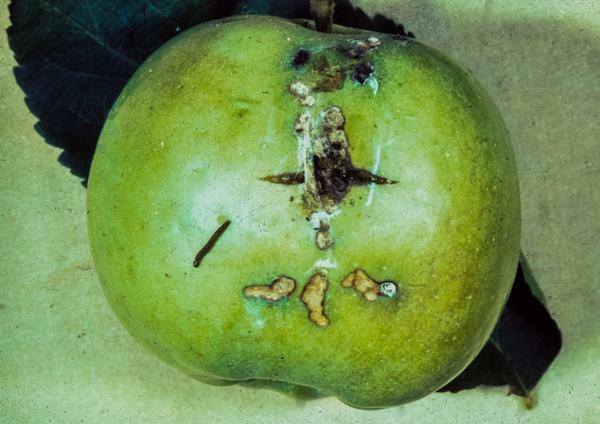 Leafroller feeding is characterized by canal-like channels in the fruit surface rather than the interior tunnel-feeding characteristic of codling moth and oriental fruit moth. TABM leaf shelter at end of branch (right). Leaf shelter pulled back to reveal fruit damage. For detailed information on insect emergence times, degree-day calculations, and the most current control practices (including recommended insecticides), read the "IPM Practices for Selected Pests" and "Relative Effectiveness of Insecticides and Miticides" sections of the Integrated Orchard Management Guide for Commercial Apples in the Southeast. Unless an individual orchard has a history of damage by this insect, it is doubtful that special precautions need to be taken. Timing is critical to the successful management of this pest. Depending on the type of insecticide used and the intensity of the TABM population, one or two applications during each of the two generations may be necessary. Maintain a clean orchard floor, particularly in the early spring before bloom, to minimize TABM populations by removing the food source for overwintering larvae. New apple sucker growth and broadleaf weeds are important food sources in the spring. 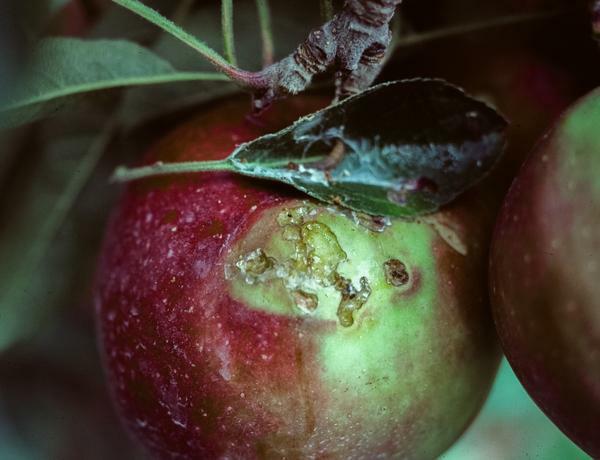 In recent years TABM populations have been reduced to very low numbers because of new insecticides used in many orchards. 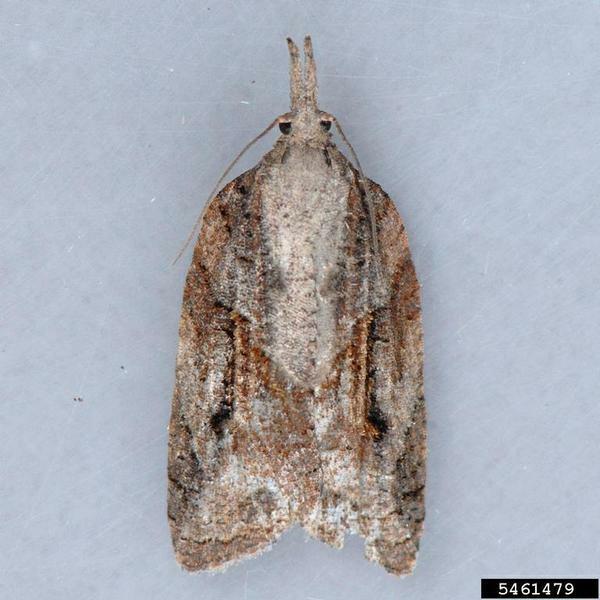 A TABM degree-day model similar to that of the oriental fruit moth and codling moth has been tested and modified for populations in the Southeast. 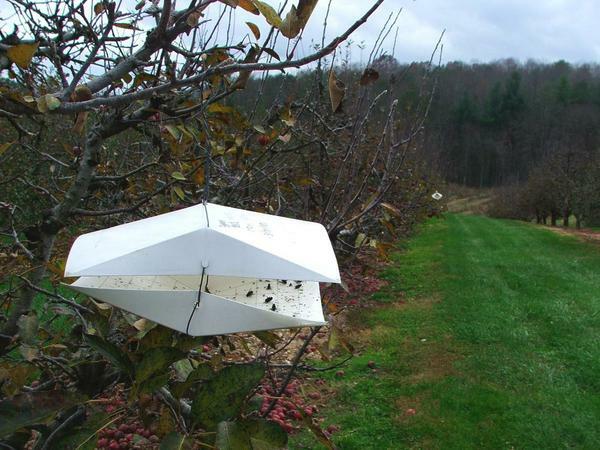 Place TABM pheromone traps at the tight cluster to pink stage of bud development at a density of 1 trap per 20 acres of orchard. Biofix is the first date on which a sustained catch occurs and may vary from 2 to 15 moths per trap over a one-week period. The cumulative number of degree days from the point of biofix is used to predict percentage of egg hatch and to time insecticide applications against the first generation. First-Generation Recommendation: When population densities are sufficiently high or if a short residual insecticide is used, two insecticide applications per generation are necessary; make the first application at about 10 percent egg hatch, which occurs between 800 and 900 DD after biofix, and the second application 14 days later. Where populations are low or if using a long residual insecticide, one application per generation should be made, and this can occur anytime between 10 and 30 percent egg hatch of the first generation, or from 800 to 1,200 DD after biofix. Second-Generation Recommendation: Depending on variety and harvest date, make one or two applications for second-generation control. For cultivars harvested by early September, a single application at 10 percent egg hatch will usually suffice; this coincides with the accumulation of about 2,600 DD after biofix (early to mid-August). Second-generation egg hatch can sometimes extend into late September, so a second application may be made in late August or early September on varieties harvested after mid-September.